Swarm Powers up Bug-type moves in a pinch. "When this Pokemon's HP is 1/3 its max or lower, its Bug moves do 50% more damage." Hustle "Boosts the Attack stat, but lowers accuracy. ""This Pokemon's base Attack is increased by 50%, but its physical moves have 80% of their usual accuracy." Truant* The Pok�mon can't attack on consecutive turns. "Whenever this Pokemon deals damage, it skips its next turn." 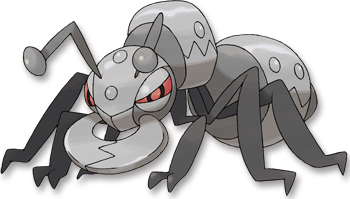 Black They attack in groups, covering themselves in steel armor to protect themselves from Heatmor. White Durant dig nests in mountains. They build their complicated, interconnected tunnels into mazes.